Researchers aim to improve patient outcomes during neurological surgery through the use of 3-D printing brain models. 3-D printing techniques continue to carve out a space in various realms of the medtech arena, and they soon could have a significant impact on neurosurgery thanks to the joint efforts of St. Louis University and the Walter E. Dandy Neurological Society. Their recent study explores the process of 3-D printing precise replicas of patients' brains to provide a model that can be used for surgical simulation--an endeavor that could help identify complications before performing surgery on the actual patient. The study is being led by Saleem Abdulrauf, MD, the president of the neurological society. He says that the mission of the study is to improve patient outcomes for the most complicated operations through the use of innovative tools and models that can best prepare neurosurgeons for procedures. 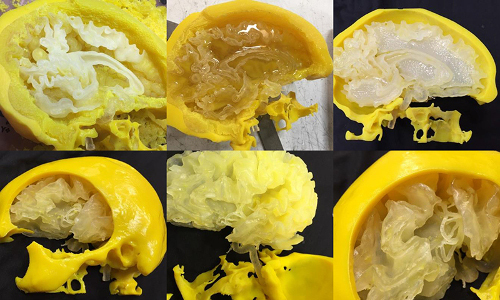 "Every aneurysm is different in size, contour, and location," Abdulrauf told Stratasys Direct Manufacturing, the 3-D printing company collaborating with Abdulrauf and his colleagues on the study. "We have hundreds of clip sizes and types we can use, and we're typically making the decision on clip size during surgery. If I can make that decision beforehand by practicing on a model using the same tools and clips I plan to use in the final operation, it really makes a difference during surgery." Learn how connected health is not for the faint of heart at next month's BIOMEDevice San Jose conference. Get free expo admission and 20% off the conference with promo code QMEDSJ. When it came to the challenge of creating a method that can simulate a brain model with an individual patient's specific aneurysm, the group found that the method would be most effective if it could create a physical model that surgeons could interact with. Essentially, they aimed to create a 1:1 scale of the patient's brain that could mimic the look and feel of actual brain matter. The group decided to take scans of a patient's brain and translate them into high resolution models which could be used to map the printing technique. The result was a polyjet 3-D printing method that can produce a 3-D model fast and efficiently, while still remaining cost effective. Abdulrauf and his colleagues have already begun to measure the potential impact of these 3-D printed brain models through preliminary blind studies. The blind studies involve using the method to model the brain of a cadaver, where they can measure the success of surgery against a group who won't use the method before performing surgery on a cadaver brain. The hope is that the group can begin to quantify the effectiveness of the 3-D printed models in presurgical training, before they begin another study that can measure the outcomes of patients who undergo surgery following presurgical training using the 3-D printed models. "The future of medicine is all based on measuring outcomes," Abdulrauf said. "The most important thing is quantifying what's better for patients, and improving the lives of patients. To do that, we must know the absolute best measures we can take, using the tools we have to improve their lives."